Vicksburg was vital to the Confederate cause. As long as the Mississippi was under Confederate control, Arkansas, Western Louisiana and Texas could effectively support the Confederate cause. Beef from Texas were shipped east to help supply Lee's armies needs. The port city of Matamoros in Mexico, just across the border from Texas, allowed the Confederates to import weapons and other supplies from England which were then transported east via the railroad leading out of Vicksburg. Loss of the Mississippi River would cut off those critical assets to the rest of the Confederacy. Grant was a determined officer, however, and did not sit waiting for something else to happen. Instead he began a series of operations designed to get at Vicksburg by one means or another. He tried sending gunboats with his troops through the bayous and swamps along the Mississippi in order to find a viable approach Vicksburg. But the heavy growth of trees and brush along with harassment by Confederate snipers as his men tried to chopped their way through the shallow waters frustrated virtually every attempt. When General Sherman tried to assault the northern part of Vicksburg just before Christmas, 1862, via one of those bayou expeditions, he was thrown back rudely. Grant then called his senior commanders together to discuss another plan. He decided to have Foote carry his army across the Mississippi and then march down the western bank of the river. Meanwhile, he would have Flag Officer Foote float his transports and gunboats down the Mississippi past the Vicksburg batteries under cover of darkness. Once south of the city, Grant would use the transports to carry his army back across the river, move inland and attack Vicksburg from the land side. Generals Sherman and McPherson were skeptical of the idea but had faith in Grant’s vision. Much of Grant's success lay in the fact that he trusted his own judgment, even when some of his trusted subordinates disagreed with him. Foote floated all but one of his boats by the Vicksburg batteries, and Grant got his army back onto the Vicksburg side of the river well south of the city. Cut off from his base in Memphis, Grant now took a daring step. Instead of trying to keep connected with a supply base on the river, he had his soldiers round up all the supplies, wagons and animals they could find and took his supplies with him. They would live off the land. When he cut loose from the Mississippi, he was completely out of touch with the rest of the Union. 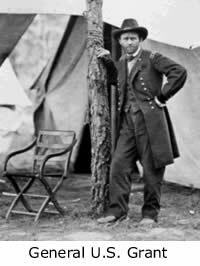 Lincoln feared that Grant had made a terrible mistake, and when he heard nothing from the general for 18 days, he anticipated only the worst. Grant’s campaign took him in the direction of Jackson, the capital of Mississippi. [See Map] Waiting in Jackson with about 25,000 men at his disposal in Mississippi was Confederate General Joseph Johnston, who was suffering from wounds and was not feeling particularly aggressive. He and Pemberton communicated with each other to try to determine a plan to defend against Grant, but Grant was moving rapidly. Grant sent a cavalry commander, Col. Benjamin Grierson, on a raid from Holly Springs to the north all the way to Baton Rouge in the South, during which Grierson's cavalry troopers uprooted railroad tracks, cut telegraph lines, destroyed supplies and generally led Confederate cavalry on a merry chase. Grierson's action, along with the fact that Grant had a spy in the Confederate Army who kept him informed, helped Grant defeat Johnston's attempts to communicate effectively with Pemberton, and also kept him reasonably well informed of how the two Confederate generals planned to defend Vicksburg. When General Johnston became aware that two corps of Grant's army were approaching Jackson, he ordered the city evacuated, leaving only a minimal defense to slow Grant's advance. The Union Army had no difficulty taking the city within hours of attacking. Grant himself moved into Jackson as his troops burned part of the city and cut off railroad connections with Vicksburg. From there Grant turned his attention towards Vicksburg to the West, leaving a small blocking force to guard against Johnston. Pemberton decided that his best course of action was to come out from Vicksburg and face Grant. He had attempted to attack Grant's supply lines, but discovered that there was nothing there, since Grant had taken all of his supplies with him. Pemberton soon realized that Grant had positioned his entire army between Vicksburg and the city of Jackson. Pemberton's men advanced to a place called Champion’s Hill, and there the two armies fought fiercely. In the end Grant's stronger army handily repelled Pemberton's Confederates. 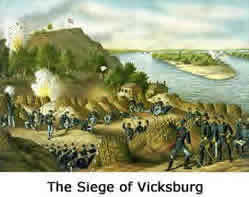 Thus commenced the siege of Vicksburg, which lasted 45 days. Grant's army on the northern flank moved back around the defenses to regain contact with the Mississippi, allowing Grant to obtain food and other supplies for his troops and ammunition for his artillery. Gunboats blasted the city from the river side, and Grant's artillery began round-the-clock bombardments that reduced the defenders of Vicksburg to keeping their heads low and hiding in caves. Completely cut off from the rest of the world, Vicksburg’s supplies began to dwindle, and Pemberton's men found that they had little to eat and even had difficulty getting fresh drinking water. The citizens of Vicksburg suffered the same deprivations as the Confederate Army. The situation quickly grew dire. For military historians, Vicksburg was the great turning point of the war. Back in 1861 the aging General Winfield Scott, who was later rudely nudged out of office by the ambitious young General McClellan, had outlined a strategy to bring the Confederacy to its knees. The so-called “Anaconda plan,” which what is widely derided in the press, was designed to have Union forces surround the Confederacy, isolate, divide and then conquer it. Scott's idea eventually won the war. Vicksburg was a major component of Scott's plan. In the spring of 1864 General Grant was promoted to the rank of lieutenant general, the first United States officer since George Washington to hold that exalted rank. President Lincoln placed Grant in command of all Union troops, in the last phase of the war was about to begin.